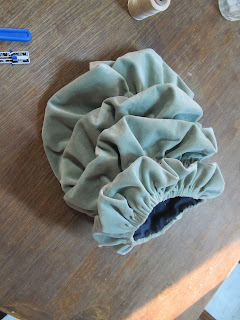 After the velvet was seamed together, I folded the raw edges of the lining inside and whipstitched the seam. I then folded the edge of the lining in about a half inch and pinned it to the already folded velvet on both the top and the bottom. And then gathered it to fit, and sewed it down, running my needle through two 'pleats', and then snatching up the lining, and then through two more 'pleats'. To attach the lower sleeves, I will probably make some lucet ties. I plan to whipstitch the top of the sleeve to the shoulder of the gown as this works best for me. But first I have a second baragoni to make, and this junction is my least favorite part. There is something very depressing about creating a sleeve, getting finished with it....and then having to do it all over again. Is it just me? Love all the detailed photos - great to learn what worked and what didn't! Thanks for posting everything!